Please apply by Friday 21st September for this residential. You can send applications back by post to Carers in Herts, 119 Fore Street, Hertford, Herts, SG14 1AX or by email to young.carers@carersinherts.org.uk. Please also send back an Annual Consent Form 2018 if we don’t have one on file. Would you be interested in helping the Young Carers team with their Young Carers in School Ambassador project? We’re looking for 20 Young Carers and 20 adults who want to make a difference in their local schools by speaking up about what it’s like to care whilst being in education and how schools can do more to help. 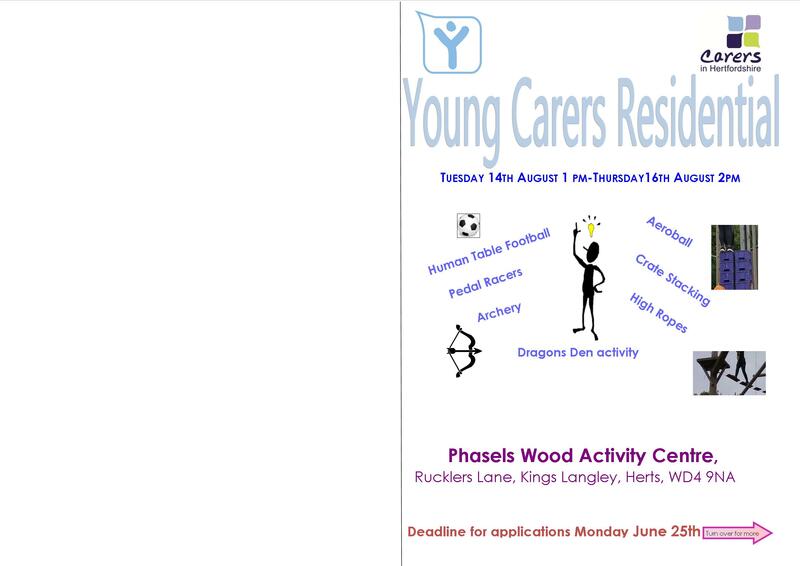 Call Amy in the office on 01992 586 969 for more information or email young.carers@carersinherts.org.uk. This is a partnership programme with Carers Trust. Groundwork Hertfordshire is supporting the Welwyn/Hatfield Youth Council to organise a fun filled away day on Thursday 30 August for Young Carers. The event will provide an opportunity for the Welwyn Hatfield Youth Council and Young Carers to spend a day taking part in a range of activities including sports, art, dance, workshops and watching a movie. The event is completely free and lunch plus snacks will be provided throughout the day. Please note that this event is not organised by Carers in Hertfordshire. Young Carers Staff will be in attendance on the day, but will not be taking responsibility for young carers or organising transport. 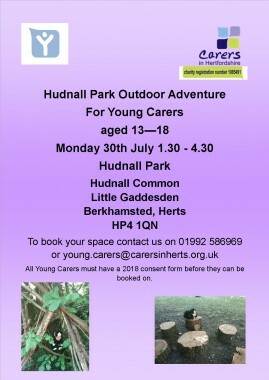 If you would like your child to attend on the day please email young.carers@carersinherts.org.uk or phone in on 01992 586969 by 1st August. Places will be allocated on a first come first served basis. Come and join us at Hudnall Park for an Assault Course and Shelter Building. Please ensure all young carers have an Annual Consent Form 2018. 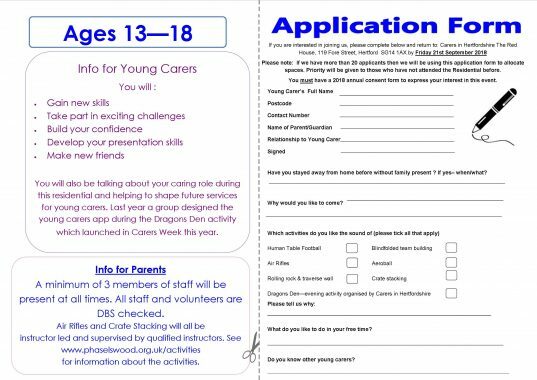 This can be posted to Carers in Herts, 119 Fore Street, Hertford, SG14 1AX or scanned and emailed to young.carers@carersinherts.org.uk. Please email us or phone us on 01992 586969 to book a place on the trip. Places will not be confirmed unless we have your consent form. 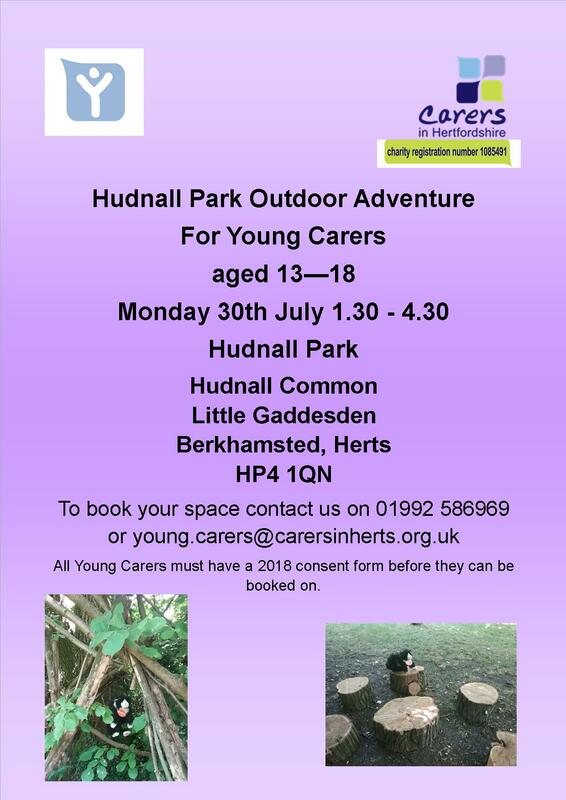 Carers in Herts will be running a 6 week ski course for young carers at the Snow Centre in Hemel Hempstead on Wednesday afternoons in the Summer Holidays. 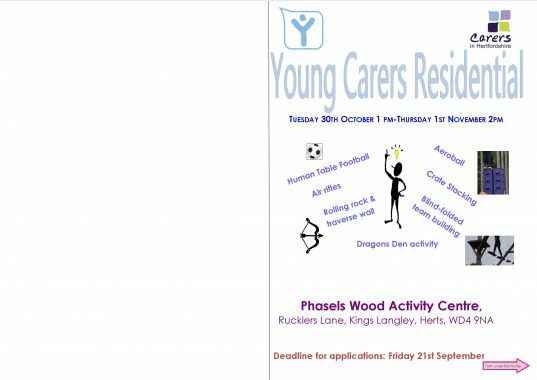 Please contact us on 01992 586969 or by email to young.carers@carersinherts.org.uk to express an interest. We will contact those who have expressed an interest in the next couple of weeks to allocate spaces. In the event that too many young carers apply we will prioritise those who will be able to attend the full 6 weeks and who have not done any skiing with us before. We will also be running Lawn Bowls in Hertford for Young Carers on Thursday mornings. We trialled this in half term and young carers said they really enjoyed it and wished it could have been longer. It was particularly good for young carers who are a little bit more anxious or worried about meeting large groups of people. It will be a small group of 8 for the whole 6 weeks on Thursday mornings. Please express your interest by email or phone as above for the skiing. 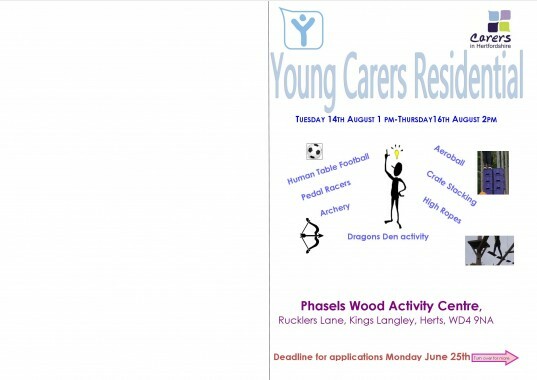 Young Carers Residential for 8-12 year olds – Phasels Wood 14th-16th August. Please apply by 25th June for this residential. 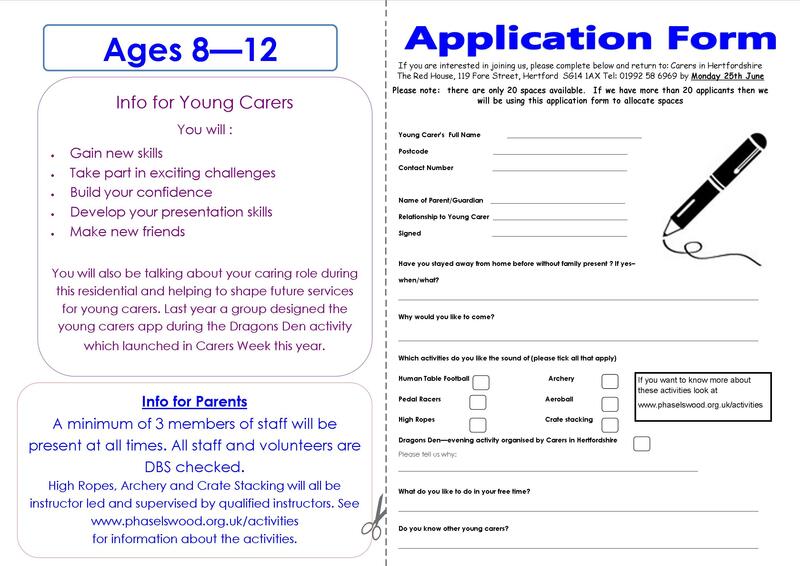 You can send applications back by post to Carers in Herts, 119 Fore Street, Hertford, Herts, SG14 1AX or by email to young.carers@carersinherts.org.uk.